Impact(?) of natural variability on Nebraska drought | Climate Etc. ← Is Earth in energy deficit? So, would you turn down a $44K grant to investigate the natural variability of drought in Nebraska? Their dismissive stance seems mystifying – until one examines climate change politics and financing. None of these Nebraska scientists seems reluctant to accept far larger sums for “research” that focuses solely on human causes; nor do professors at Penn State, Virginia, George Mason, or other academic or research institutions. They’re likewise not shy about connecting “dangerous manmade global warming” to dwindling frog populations, shrinking Italian pasta supplies, clownfish getting lost, cockroaches migrating, and scores of other remote to ridiculous assertions – if the claims bring in research grants. American taxpayers alone are providing billions of dollars annually for such research, through the EPA and numerous other government agencies – and the colleges, universities and other institutions routinely take 40% or more off the top for “project management” and “overhead.” None of them wants to derail that gravy train, and all fear that accepting grants to study natural factors or climate cycles would imperil funding from sources that have ideological, political or crony corporatist reasons for making grants tied to manmade warming, renewable energy and related topics. Perhaps they would be tempted if the Nebraska legislators were offering $4 million or even $440,000. But a lousy $44,000? Nebraskan (and other) researchers must end their hide-bound focus on human causes – and start working to understand all the complex, interrelated factors behind global climate changes and cycles. Government financiers and policy makers must do likewise. Our future well-being depends on it. Because those three scientists took a stand for scientific honesty and integrity. And because CFACT, mistakenly assuming that any scientists who disagree with them are scoundrels and jerks, concluded they took their stand out of greed. Let me tell you about these scientists. There’s Mark Svoboda. He’s been successful at obtaining research grants. He has to be. The University doesn’t provide him with any salary! Nonetheless, he’s become one of the world’s leading experts on droughts and how to deal with them through the National Drought Mitigation Center. Right now, he’s working on funded projects for drought detection, adaptive management during drought onset, drought monitoring, mapping drought, analyzing historical drought, and so forth. Drought in all its flavors. Not just natural drought. Not man-made drought. Drought, period. There’s Martha Shulski. She’s director of the NOAA High Plains Regional Climate Center. Besides Center funding, which is provided by NOAA for climate data archival, access, and synthesis to fulfill regional data needs and decision-making, she’s working on funded projects for running Nebraska’s automated weather network, helping farmers irrigate more wisely, and helping farmers utilize information on climate variability and change. That’s climate variability AND change, not climate variability OR change. She once participated in a study called “What killed the reindeer of St. Matthew Island?” The answer: global warming? No. Overpopulation followed by a bitterly cold winter. The other two, by the way, didn’t feel entirely comfortable speaking on the record to me. I can understand why. You never know whether a politician might get upset at something you say and yank your funding. Three climate scientists. All with different specialties. All trying in their own way to help officials and the public understand the whole climate. Not just some cyclical part, not just an anthropogenic part, but the whole climate. Hey, CFACT, I have news for you: we climate scientists, at Nebraska and elsewhere, are already doing this. We refuse to be told by politicians to restrict the scope of our scientific investigations. Some of us feel so strongly about this that we are willing to pass up grant money that comes with politically-motivated restrictions. And we’re willing to do this even at the possible cost of having our reputations dragged through the mud by the likes of you. Because, despite our best efforts, some of us get used as political pawns anyway. There is medium confidence that some regions of the world have experienced more intense and longer droughts, in particular in southern Europe and West Africa, but in some regions droughts have become less frequent, less intense, or shorter, e.g., in central North America and northwestern Australia. In North America, there is medium confidence that there has been an overall slight tendency toward less dryness (wetting trend with more soil moisture and runoff; Table 3-2), although analyses for some subregions also indicate tendencies toward increasing dryness. The most severe droughts in the 20th century have occurred in the 1930s and 1950s, where the 1930s Dust Bowl was most intense and the 1950s drought most persistent in the United States, while in Mexico the 1950s and late 1990s were the driest periods. Recent regional trends toward more severe drought conditions were identified over southern and western Canada, Alaska, and Mexico, with subregional exceptions. The University Nebraska Lincoln has published a report Climate Change on the Prairie, with a Climate Impact Reporter, and Climate Change Projections and Possible Impacts. derived from climate models. Ok, I’m mystified. The link to the legislative bill can be found [here]. Exactly what is the problem with Nebraska lawmakers wanting to support research from its state land-grant university to help them understand the natural variability of drought? Presumably they want to understand what the state might be facing over the next few decades in terms of drought. It is very difficult to make an argument that this variability over the next few decades will be dominated by AGW. So, what is going on with Nebraska politics? From the Wikipedia, it is seen that Nebraska is solidly Republican, with Republican governor, senators, and representatives. Interestingly, Nebraska is the only state in the U.S. where the state legislature is nonpartisan, holding non-partisan elections to determine its members. And what is going on with the University of Nebraska climate scientists? I don’t know any of the climate scientists mentioned here. I went to the web page for the Nebraska state climate office, and there is nothing there, says ‘website under construction. I went to the High Plains Regional Climate Center web page, it looks reasonable and seems to provide a lot of relevant information for agriculture, etc. With regards to climate change, they have a web page with a variety of links to published reports. So why this conflict between the UNL climate scientists and the lawmakers? I really don’t get it, and neither CFACT’s or Nielsen-Gammon’s explanations make sense to me. 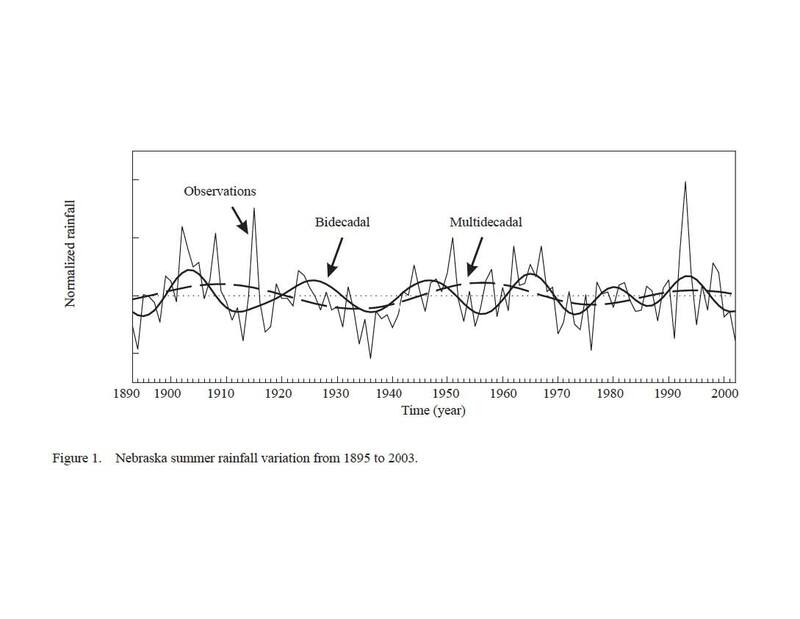 JC message to Nebraska lawmakers: I understand why you want to better understand and predict the natural variability of drought in Nebraska, such as seen in Figure 1 above. I have been studying climate variability in the high plains, specifically temperature and winds, for a DOE funded study on predicting wind power variability. For $44K, I would be happy to extend our study to include precipitation and drought, interpreting Nebraska climate variability in context of the stadium wave and including probabilistic projections of extremes for the next two decades. And I am sure that there are other researchers outside the state of Nebraska who would be willing to address this topic also. It is fascinating that these University of Nebraska so-called “scientists” refused the $44k grant, and very telling about the current state of affairs in climate science. Well, $44K is not a lot, and if they have to pay full university overhead (maybe 50%), then this won’t even pay for a graduate student. If they decide to give me the funds (ha ha), then I would have to run the money through my company CFAN which has minimal overhead. If it was $440K, i suspect that no one would turn that down. As they say, $44k or even $22k, is far better than a sharp stick in eye, but I am incredibly ignorant about how grants and such, work in academia. Chuck just start by thinking of a living wage. What is the average US wage, what should a graduate scientist be paid? Forgetting other costs, it won’t pay 12 months wages. You say ‘it wouldn’t pay 12 months wages’. Maybe not. But work tends not to come in convenient man-year chunks. No self-respecting consultancy who wishes to remain in business turns away work because its terms do not fit their accountancy system. And that is what you are suggesting. Academics like to portray themselves as the goto unbiased consultants on may matters. But if they turn away work on such specious grounds, I’d make very sure they weren’t offered a second tranche. Hard though it may be to grasp from within the ivory tower, but the rest of us do not just exist for the purposes of suiting your convenience and paying your wages. If you guys can’t be arsed to undertake the work we are interested in, I guess we won’t be quite so keen to pay your wages next time around. What’s next for Nebraska? the commissioning a biology study that isn’t allowed to include the theory of evolution? Why would most in the CAGW biased academia want to walk around with “pariah” and a target pinned to their back for such a small grant ? Neilson-Gammon’s prejudice shows. He automatically assumes that a grant request to study natural variability is political. When are academics going to wake up to the fact those whom they hate with all their guts, are not stupid? He believes that a grant offered, by politicians, to study natural variability as isolated from anthropogenic influences, to be political. This is going to be a fun discussion. I predict everybody here will see the shadowy hand of politics in those from the other side of the debate fro m them. I recall Peilke Snr repeatedly complaining about NSF grant funding because it didn’t take seriously non-CO2 focused research. Shadowy hand of politics on the other side, and “Who, moi?” on their own side. Advocacy on the other side and pure-as-snow innocence on their own side. Appeals to authority on the other side, and complete scientific integrity on their own side. I have completed my study using cornhusker data gathered by Lewis and Clarke around 1804. Cornhuskers should send my 44k to JCH in Fort Lurch, Texas. Thank you. Uh.. because the idea of starting with a foregone conclusion and bending the data to fit the explanation is not Science, but propaganda? So, I see no reason to decline $44K to produce whatever conclusion someone wants, if one isn’t pretending to be a scientist any more. Especially if one is working on improving their reputation as a propagandist. If the mechanic has fastened the chocolate syrup hose to the vanilla dispenser, it’s pointless to study racial purity. Drive through Nebraska. You’ll see a lot of irrigation. I wonder at this as well because orthodox climate science claims that they can and that the science is settled. The Industrial Revolution started a quarter millennium ago. CO2 Forcing is a major determinant of how climate basins acquire energy. Can you look at any data and sift out from it the ‘natural’ and the anthropogenic parts by any means whatsoever? I’m certainly not proposing excluding variability from study; nor do I think anyone is seriously proposing a model where there is no natural world whatsoever but only what humans make. Which would be the only case in which your question about Figure 1 makes any sense whatsoever. In other words, the only anthropogenic components of any study allowed are to point fingers of blame for ‘unintended consequences’ of actually doing something about anthropogenic climate change. How is that anything like Science? Can you really not appreciate the double standard at work there? The Nebraska lawmaker who initiated the Legislature’s first study of climate change now prefers to see the study abandoned rather than continue along what he called a politicized, scientifically invalid path. State Sen. Ken Haar of Malcolm said Tuesday the state committee handling the study is disregarding the intent of the Legislature. Haar, a Democrat, is asking his fellow senators to help him salvage the $44,000 study by encouraging the committee to reconsider the restrictions it published Monday in the official request for study assistance. The use of the term “natural” would rule out the primary cause of the climate changes that have occurred in the last half-century: humans. The issue of “cyclical” climate change was successfully amended into Haar’s bill by Sen. Beau McCoy of Omaha, a Republican candidate for governor. McCoy on Tuesday elaborated on his opposition to using state tax dollars to study man-made climate change: Humans aren’t capable of influencing climate patterns. Are you really willing to put your name on a study concluding “Humans aren’t capable of influencing climate patterns,” per the terms of the bid? As the primary impact of this bill is on emergency response and emergency responders and the victims of extreme events. The $44K? That’s nothing compared to human lives and livelihoods on the line in an emergency. I can say any expert in emergency response would be shocked and appalled by such manacles on what they can and cannot consider in preparing for emergencies, such blinkers being put on their information sources and advice about what they need to know. Sure, it’s all fun as an underdeterminist academic exercise, but this is where the rubber meets the road, and people’s real lives are really being put in danger by this desperate and despicable charade. Emergency responders need the best possible information heading into a situation, including human agents behind the threats, whether it’s jihadists flying planes into buildings or gangs shooting at fire trucks on their way to face burning buildings, or the frequency and degree of cyclonic systems. Speaking of, one notes the mean path length of tropical cyclones has consistently increased over 15% in the past four decades, across all major tropical cyclone basins. The area of these basins has increased at least 32% in the same time. The area of the origin of cyclones has increased by a quarter in the last half century across basins, and the cyclone seasons have increased substantially in length. Which of these clearly non-cyclic facts do you think you should be still keeping from emergency planners? Kinda sounds like North Carolina where they passed a law that said you must use historical data instead of climate model output to project future disasters. What has happened and keeps repeating is much more likely than what does not repeat and actually has never happened and where no actual data indicates it might ever happen. The unnatural climate stuff has been studied to death. You resent a tiny 44k study of natural stuff and demand it include the junk that has been studied to death. It would take more than 44k of study to get started on a study that does both. They have spent more that the 44k just talking about it. There is no data that shows the sky is falling. What has happened before is a better guess at what will happen next than any output from Models that demonstrate NO SKILL. About the Industrial Revolution, that included irrigation I suppose, the ability to checkerboard the land with densely packed farms, and the ability to ship corn to far away places increasing demand. The intensity of the use of what was prairie land has increased. While these things are dependent on CO2 producing fuels, I think it’s an indirect link. At the same time it seems CO2 has a correlation with how intensely the land is being farmed. I agree that separation of the two things is difficult. Perhaps this issue is one of enough is enough. It’s expected to hear about climate change and how we forced it in most studies. Call it a reaction to the constant refrain we hear from most climate scientists. As they get the weather report in Nebraska without a mention of climate change, is it also possible to get also get a study of climate variability on those same terms? Perhaps this is an effective test that asks, is it possible to talk about climate variability without mentioning CO2? Perhaps integrity requires that one must always mention CO2 without exception. This issue looks political. McCoy looks to have made a point. Pushing the science/political issue into public sphere where it is more widely looked at. And that seems a good thing. About the discovery of electricity, that included telegraphs I suppose, the ability to checkerboard the land with densely packed antennas, and the ability to send signals to far away places increasing communication. The intensity of the use of what was face to face has increased. While these things are dependent on wires, I think it’s an indirect link. At the same time it seems electricity has a correlation with how intensely people talk about things. I agree that separation of the two things is difficult. Perhaps this issue is one of enough is enough. It’s expected to hear about electrons and how we motivate them in most studies. Call it a reaction to the constant refrain we hear from most electricians. As they get the telecommunications report in Nebraska without a mention of electronics, is it also possible to get also get a study of telecommunications signals on those same terms? Perhaps this is an effective test that asks, is it possible to talk about telecommunications without mentioning electronics? Perhaps integrity requires that one must always mention electronics without exception. This issue looks political. McCoy looks to have made a point. Pushing the electronic/political issue into public sphere where it is more widely looked at. And that seems a good thing. > McCoy looks to have made a point. Must we talk of electricity or is it a given? We could say without a source of electricity, telecommunication becomes difficult to impossible. But isn’t that a given? If I were President of Verizon, would I constantly remind my people, that we need electricity to operate. Would I remind them to keep some diesel on hand to run the back up generators in case we lose power? Perhaps my question is, can we say the climate changes and leave it at that? What requires us with every mention of it, to pay respect to our influence upon it? I wonder at this as well but orthodox climate science will have us believe that they can do this and that the science is settled. 3 x 4 x 5 = 60. We can all agree on that. It’s pretty much mathematically inescapable. So, can’t we just say numbers increase as we count, and leave it at that? What requires us every time we count to pay respect to the effect of adding one to four? Can’t we just say 3 x 4 = 60? Well, we freaking could, but we’d be freaking wrong. And if you’re doing flood control planning, and your plans rely on knowing that you need sixty sandbags packed three deep by four high, you better be able to pay respect to the influence of all five columns of sandbags you need to stop the flood. I am boggled that there are people who need this explained to them. No offense intended. Can you look at Figure 1 and deny that there is natural variability? But someone who doesn’t want to see it might be able to. I think we’re drifting apart here. I want to order a hamburger. Just to humor me, how about I don’t have to say, I’d like a cheeseburger, hold the cheese please. It’s like hamburgers have been disappeared. There are only cheeseburgers, with or without cheese. In only studying natural variability, one wants a hamburger, and they want to name it a hamburger. And I think it’s an interesting test, to see if they could do that, and not have to be disowned, for having done that. Except you’re not trying to order a cheeseburger hold the cheese. You’re trying to order a hamburger, hold the leucine, one of the principle amino acid building blocks of beef, integrated throughout every part of the beef patty. It won’t be in this study, based on the terms of reference. As you’re hostile to scientific orthodoxy, apparently extending to cover high school mathematics, you perhaps won’t appreciate that you’ve failed to grasp the distinction between differentiation and integration. If AGW is integrated in the influences affecting what appear to be cyclic — to a layman, when in point of fact there is no fixed period nor other indication of actual cyclic component longer than annual on the data, at least for the last half century when the Hale cycle’s influences were extinguished, most likely by AGW — data in a complex subdomain of a complex universe of complex subdomains, it’s entirely a different matter to understand that input than to derive it back from the result. Find a high school graduate to explain this to you. > Can’t we just say 3 x 4 = 60? I didn’t see that anyone was being asked to reach a metaphysical “conclusion,” let alone to bend any data, only to describe cyclical historical changes in drought conditions in Nebraska. These are local and prior to the believed onset of AGW. Neither the A nor the G, nor even necessarily the W seem germane. Then it appears we must chose whether we credit the interpretation of the whole government of Nebraska about what is being asked, or your interpretation, which comes to the opposite view. The bill itself acknowledges the A, in paragraph 8, but only so far as unforeseen outcomes of actions taken to counter the effects of A, by A, are concerned. If you don’t understand how G-scale influences play a role in local climate basins, if you really thing everything outside the borders of Nebraska has nothing to do with the climate of Nebraska, you really aren’t in any position to dictate what is germane. The question would be if the politicos ARE demanding particular conclusions. You can study natural variability and find no strong link. If we are just speculating maybe the three scientist are just scared to look for fear of what they might find? Dude, they’re being asked to provide what by any scientific definition is bad information to emergency planners for money. Declining to participate isn’t fear (except plausibly fear of being prosecuted like the Italian earthquake experts were when they didn’t strenuously object to political flunkies spinning what they’d said to a similar committee); it’s simply ethical standards. So, while it’s an interesting acid test, to see who will sell out emergency responders for $44K by taking up the study, that’s about the only scientifically meaningful value of the study. Bart I don’t see it’s bad science that an expert provides detailed information on one part of the system if that;s what authorities demand. If somebody wants to know fire risk in a building is it bad info to ask a material scientist to provide info on flammibility of materials only, And then ask a people movement expert to provide info on how persons will move through the structure in an emergency. And ask another expert to assess the building in relation to civil emergency services etc. etc. etc. If you identify that natural climate variability is part of the mix then there is nothing wrong to ask for an “initial” report that focuses on that part of the story. You could only think it’s bad science if you deny a role for internal variability. Gaps in knowledge need to be filled by focused energy. HR, you give the Nebraska politician too much credit. If you read the background, you can see he added “cyclical” because he doesn’t believe in any other kind of climate change. There’s no nuance here. It’s just tampering with climate research funding for political or personal bias ends. Again, faulty analogy. You can separate material flammability from movement of people, because there’s a plausible way to differentiate, and because you know there are materials and people. Nebraska has in essence put into its law a conclusion that there are cycles when there are no hallmarks of cyclic behavior in the data beyond single year span, at least since the 1950’s. In that way, your analogy would be like asking experts to focus only on the movement of people in an emergency who have been dead over fifty years.. except more useless still, as there’s some way to distinguish the motion of dead bodies from the motion of living ones, and some utility to knowing about the shifting of human remains over time. If you don’t get that this future candidate for governor of Nebraska has put emergency responders’ lives in greater danger for political advantage, it’s time for you to back away from the discussion before you do actual harm to actual people. Seems like the foregone conclusion is AGW. Natural variability certainly will exist; seems the study was to find the “recent” range of variability. Don’t see that as being so non-scientific. Perhaps you can point to the philosopher of Science who agrees with you, and disagrees with Hook, Halley, Newton, Einstein, Popper and Feynman, about what is and isn’t seen as being so non-scientific. Oh, and maybe find a good reference work to get an explanation of how the phrase “the foregone conclusion” works; in your usage, it appears you mean “consider the possibility that one of the influences”, which is pretty much the opposite of the way everyone else uses “foregone conclusion”. Would a grant set aside to study human influence on the climate qualify for the same treatment under your holy vision? Kudos to Al Dutcher. Sounds like an honest-to-god skeptic. Not too many of those in these here parts. There’s a whole bunch of them around. Presumably they want to understand what the state might be facing over the next few decades in terms of drought. It is very difficult to make an argument that this variability over the next few decades will be dominated by AGW. It’s even more difficult to make an argument either way if the terms of your research grant specifically exclude consideration of AGW as a factor. We already have numerous studies that purport to quantify the impact of AGW. And we have a candid admission that these work poorly at the regional level in part due to internal variability. Internal variability is accept as part of the mix in climate so what is really wrong with studying it? All science funding is to a greater or less extent directed. Perhaps if they had asked for a study on the natural internal variability part of climate change, they might have had some takers because that is a recognized term. Cyclical climate change is just poor wording. Well personally I wouldn’t put too much emphasis on the word “cyclical” – my (possibly mistaken) interpretation is they are referring to natural variation in general. But even so, if you are looking at the last hundred years or so it is surely necessary to recognise that human activity (not just AGW) has played a part at least to an extent, so while I’m certainly not opposed to researching natural variability per se I don’t see how over certain timescales you can do so without also considering the anthropogenic influence as well. I think one has to also ask what the legislators are trying to achieve here. If (as seems likely) they want to find out what is in store for future years, decades or whatever it seems ludicrous not to consider at least the possibility that there human activity might have a significant role to play. If they already had a study of the warming effect on agriculture (I think not), then this would be a reasonable companion study. But politically it seems they can’t even talk about warming in their state, so this is the best they could do for putting climate-related money out. “Cyclical climate change” may be “poor wording” in your opinion, but it is an observed fact. 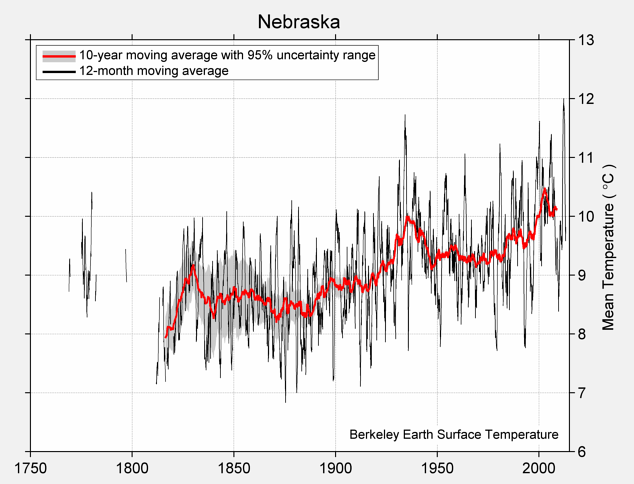 Climate is at least a 30-year average, and applying that to Nebraska, I am fairly sure the first-order thing you see in temperature is not, in fact, cyclical, but rising, and 30-year rainfall may also be quite flat and non-cyclical on the climate scale. Droughts are a sub-climate phenomenon that can only be described by a frequency. Is this frequency cyclical or trending? That is the question, but the title seems to assume that it is cyclical rather than trending, which is what is wrong with it. Why not leave the scientists to decide based on their work? Mainly because if a trend is found, it would be politically problematic, so they cleverly pre-empt that possibility. Annual precipitation in the cornbelt is up. I’m just guessing based on the changes in how they harvest in Nebraska, Dakotas, and Minnesota, but my bet would be fall precipitation is especially up. More ergotamine. Now there’s an excuse. As is noted above the Nebraska legislators already have the IPCC viewpoint (which is myopically slanted toward AGW and finds NO increase in future Nebraska droughts from this cause) – so now they need to know what scientists tell them Mother Nature is going to throw at them. But as our hostess mentions, for $44,000 they are not going to get a lot of research work. All I can see above is a quote about past trends, I don’t see anything about finding no future increase in droughts due to AGW. If the goal is indeed to understand what the state of Nebraska might be facing over the next few decades in terms of drought, then it only makes sense to include all forcings to the climate that might influence drought. Suggesting that anthropogenic forcing is unimportant or should in any way be excluded, would produce research that might be academically interesting, but not relevant for understanding all the current factors affecting drought. Honest scientists should turn down restrictive research that specifically limits what they are supposed to look at– if the goal is to actual understand what the future drought factors are. Can one know the forcings if one doesn’t know the natural variability? How do you new what is out of the ordinary if you don’t know what “normal” is? This is an issue larger than Nebraska, of course. The protests seem lame and more guided by politics than the grant itself. I agree with Prof. Curry, this $44K grant is small potatoes (if this was ID or ME). Small ears? You could look at it that way. Then it is possible that the research so far of the “Honest” possibly didn’t include the PDO shift and the potential AMO shift which appear to be impacting climate in Nebraska more than originally predicted. I imagine the state of Nebraska has more than enough “honest” studies that didn’t mention the probability of the recent Platt river flooding which makes it a bit of problem anticipating the needs of the state. Some could think that the over abundance of “honest” but not very reliable climate science could indicate that the State of Nebraska is more concerned with competence than “honesty”. No one is “suggesting that anthropogenic forcing is unimportant or should in any way be excluded” from the overall evaluation. But the good legislators already have the “best available input (? )” on the likely effects on Nebraska drought frequency and intensity resulting from anthropogenic forcing, namely that there should be NO INCREASE in either. So now they need to know what the natural forcing and variability could do to them. The only thing that does NOT make sense is the paltry sum of $44,000. If they want any real research work, it would seem to me they need to up the ante. What an amusing post and thread (so far). How many times, per day, are there posts here at Climate Etc. that drone on about how the study of climate change is inherently political, funded for political objectives, carried out by “activists,” and filtered through biases so as to advance political outcomes. And now, suddenly, Judith is “mystified?” And our much beloved “denizens” are shocked, shocked I say that some might think that politicians offering to fund a study focused on 1/2 of climate change causality are working towards politicized outcomes? Perhaps Judith has forgotten how many times that the argument has been made here that the work of the IPCC, and the research of climate scientists, is inherently biased because (supposedly) they are specifically focused on measuring anthropogenic contributions to climate change an not natural variability? Oh. Wait. That’s two things. Should have been more precise. I meant one of two parts…. not 50%. The question of whether it is 50%, more, or less, is beside the point as long as there’s agreement that you can’t measure the one without examining it in context of the other. WHO is asking for a climate study? These folks, believe it or not Joshua, are POLITICIANS. But excluding AGW from the future drought risk study makes good sense for another, totally different, reason. IPCC has already done this study and concluded that for Nebraska there is no risk of greater intensity or frequency of droughts resulting from AGW. So – if even IPCC (who tends to exaggerate negative AGW effects and impacts) concludes that there is no greater risk for Nebraska, it does not make sense to research this question any further. It now makes sense to get an expert opinion on whether or not natural factors will likely result in a greater risk – so that is what the good lawmakers are proposing to do (but they won’t get too far with $44,000 chump change). Is that right? Or has the IPCC said that as of yet, there is no clearly discernible fingerprint of AGW in the drought record for Nebraska, but that there is some degree of greater risk of drought going forward that is attributable to AGW? With this, of course, I agree. I just don’t see how it would make sense to try to ascertain the risk of drought by extracting any contribution of AGW to the risk and disregarding it. The risk of drought would be the combined anthropogenic and natural factors. IPCC (who is obviously trying to merchandize the CAGW brand) concludes that no potential increased risk of future droughts in Nebraska resulting from anthropogenic global warming has been found. So now the Nebraska legislators want to know if natural factors are likely to pose such a risk. Intensity of precipitation events is projected to increase, particularly in tropical and high latitude areas that experience increases in mean precipitation. Even in areas where mean precipitation decreases (most subtropical and mid-latitude regions), precipitation intensity is projected to increase but there would be longer periods between rainfall events. There is a tendency for drying of the mid-continental areas during summer, indicating a greater risk of droughts in those regions. Precipitation extremes increase more than does the mean in most tropical and mid- and high-latitude areas. But from the AR5 excerpt, while it is clear that they’re saying no historical trend of increased drought was identified (frequency and intensity) – it isn’t clear that they’re saying that there is no projected increase of risk of drought in Nebraska (apparently AR5 does clearly indicate increased risk of drought in the SouthWest). So the question I have for you is what are you basing your statement on? Exactly what is the problem with Nebraska lawmakers wanting to support research from its state land-grant university to help them understand the natural variability of drought? How would it be possible to “understand” the natural variability of drought without placing it into context with anthropogenic influences on drought? That would be like saying that you can understand the anthropogenic influences on drought without understanding the natural variability of drought? Isn’t a fundamental thread that runs throughout your advocacy the argument that it is impossible to quantify uncertainty unless the relationship of natural and anthropogenic influences on climate are studied in relation to one another? Why would you fail to see the “problem” with practices that implement what you constantly talk about as what undermines the work of those scientists you disagree with? That’s right, Joshy. Clap her in irons then throw away the key. Your indignation is just so convincing. Your prosecutorial tone so eminently deserved. My personal respect for your brave and noble command of the issues only grows stronger with time. So what do you think Joshua actually is? The monotonous sameness implies machine, the schedule to comment implies shill. That is not difficult. Natural variability is huge and the anthropogenic influence is small. The dust bowl was an extreme example but what has happened does happen again and the stuff that has not happened has not happened yet. We are waiting and watching, we are waiting and watching, we are waiting and watching, . . . . . . .. . . . . ..
Wouldn’t any data from soil horizons (undisturbed of course), lake sediments, tree rings etc. that sample the pre-agriculture days of Nebraska be able to provide a pure signal of natural variability? The Kansas-Nebraska Act was passed by Congress in, 1854. The Nebraska Territory was settled extensively under the Homestead Act of 1862 during the 1860s. Data that predates ~1860 would be interesting to see; does the multidecanal behavior seen in Figure 1 extend backwards for centuries and millenia? That seems a valuable piece of information to inform of future experience. Some might even argue that since the temperatures recorded by modern instruments fall well within the boundaries of all known temperatures, that everything that we’ve observed to date is “natural variation”. But that would be scientific, wouldn’t it? And therefore it would fall outside the boundaries of the church of climatology…..
You may wish to wait for an answer to your question from Judith, but (since it is a question that involves logic rather than the intricacies of climate science) I believe I have answered it above. Joshua, now you get it. You’re almost there. Yeah, all Joshua now needs is to replace his sense of irony with stealth advocacy. It’s amusing as Hell, and sadly revelatory, to watch Joshua attempt to mask his blatant advocacy with ironic construction. The premise of such a study is wrong. How do you look at cyclical variations without first removing secular variations and quantifying each? You can’t look at one part of the variation and assume the other part is zero or even just a given. If Nebraska has warmed by 0.5 C in the century, should you ignore that in a drought study. How about the man-made variation of using aquifer water for irrigation in that region in the last 50 years, and the aquifer being depleted? Should that be ignored too? They have a more man-made climate than anyone. I agree with the scientists who turned it down. Presumably, they want to understand the kinds of variations shown in Fig 1. If there is any secular trend in Figure 1, it is not large if my eyeballs are to be trusted. The bill says nothing specific about completely ignoring human effects in all aspects of the analysis. They really don’t know, they don’t understand, they don’t even suspect.. They are doing “green” stuff and they do not understand the consequences. Can Nature be subdued to politic’s* constraint? Her smallest fragment is still infinite! I’ve stated this before, but will repeat it. The Nebraska legislators already have an “expert opinion” on whether or not AGW presents an increased risk of more frequent or intense droughts in their region. IPCC AR5 concludes that this is not the case. The legislators now want to know whether or not natural forcing or cyclical variability presents an increased risk of more frequent or intense droughts in their region. For this estimate they are willing to pay $44,000. All very logical (except the amount of the grant). And, as Dr. Curry has pointed out, the past record shows cyclical swings but no underlying trend that could be attributed to AGW, so the past empirical evidence seems to confirm the IPCC projection. The more interesting study than just rainfall cycles is whether, if the rainfall stays the same and the temperature rises, you get more droughts. However, this wants to ignore that part, leaving not much of interest to study. Man Made Climate has been studied and natural climate variations have not been studied or understood to the point that the natural variations are not even suspected. Warming from Man Made CO2 is what they are refusing to study. All these other things are natural. We are natural and our CO2 is natural. These guys already know (from the “horse’s mouth” = IPCC) that there is no risk of increased frequency or intensity of droughts in their region from AGW. This research work does not need to be re-done. What the good lawmakers do NOT know is whether or not natural forcing or variability are likely to cause such an increased risk – so that is what they are wanting to get some research on. Do you think they would believe or even read the IPCC reports? A lot of them think anthropogenic climate effects are so far insignificant but Nebraska’s temperature has already gone up by a degree in the last century. Statistically, because of weather noise, it is hard to prove trends in either direction for droughts even in a changed climate, so the IPCC can show no certainty there especially as this is regional climate. Just because average summers will be several degrees hotter doesn’t mean there are more droughts, because that requires a rainfall trend factor that remains less predictable. They might do better to study how mean temperature rises would affect their crops. The fact of the matter is that IPCC has already given an expert opinion on whether or not AGW poses a clear potential risk for increased future intensity or frequency of droughts in the Nebraska region – concluding that it does not. Speculating on whether or not these legislators “believe or even read the IPCC reports” is silly. In addition, the legislators may have seen the graph showing the cyclical variations but no underlying trend that could be attributed to AGW. So it is very logical for them to ask for a study on the possible natural risks. manacker, the legislator who inserted the word “cyclical” into an otherwise reasonable subject for study is a known denialist. See his other quotes in some articles referenced throughout this thread. It is also clear that “cyclical” has no meaning in the context of Nebraska’s climate change, except that it implies ignoring trends that may or may not be detected as part of this study. So what, in the end, is the point, other than to imply that the cyclical droughts will continue to be cyclical. That would not be a study, but a sham, and the scientists saw through it. To those of you saying that it’s automatically bad science to study droughts excluding human influences, isn’t understanding the natural variability that happens without human interaction kind of a key starting place for a good scientific understanding of what human influence might be? It strikes me that a whole lot of the climate science kerfluffle stems from the fact that we don’t really understand natural variability without human influences. We don’t really know what the climate would do on it’s own without us meddling with it. So studies that automatically assume agw are confounded from the get-go. To those of you saying that it’s automatically bad science to study droughts excluding human influences, natural influences, isn’t understanding the natural variability the anthropogenic impact that happens without human interaction natural variability kind of a key starting place for a good scientific understanding of what human natural influence might be? Too sophisticated for me. Are your models really excluding natural variability on purpose? It seems to me that we have come to the ridiculous state in science, where we have to distinguish between getting the politically “right” answer, as opposed to the scientifically “correct” answer. The former is that CAGW is a dominant effect; the latter is what the science actually shows. At the moment, if scientists want money to study the atmosphere, it is essential that they get the “right” answer. If you get any other result, you risk future money, and even your scientific career. This thread is a case in point. We also have the ludicrous situation where no less a scientist than Sir Brian Hoskins, briefed Lord Lawson on CAGW, and insisted that the information be kept secret. Now why on earth must the discussions be secret? Except that Sir Brian must have known he was providing the “right” answer, and not talking ;proper science. “Oh! what a tangled web we weave, when first we practice to deceive” Sir Walter Scott. They don’t get paid much for a right answer. They do get paid much for any alarmist answer. What’s this world coming to that you can’t produce a squiggly line drawing for less than $44K? Interesting thread. Scientists should be able to look at data with whatever assumptions they please- as long as the assumptions are specified. If those involved use any of the “adjusted temperature” data sources the anthropocentric data are already incorporated (GISS, HadCrut etc.). It sounds to me like the State government might like to see an answer based on raw data that hasn’t been filtered by the models on the “other” side. So would I. What is still missing is the long-awaited station siting (UHI) data. Still more questions than answers. Dear Nebraskans; your climate will vary apparently cyclically and apparently naturally. Please remit the forty-four large. I’ll do it printed in color for forty. Hell, I’ll add 3-D displays for 35. Heh, Blinded by the Null. It seems obvious that this particular funding has become highly politicized. That’s the case independently on the actual restrictions it places on the study. Accepting funding, when it’s so politicized, would mean accepting the motives of those who are behind the restrictions, not only the actual limitations that those restrictions force. Heh, same same applies to all of the politicized climate research of the last, say, about twenty years. You seem to feel that this particular funding has become highly politicized”. I’d submit that this “ain’t necessarily so”. The Nebraska lawmakers already know from IPCC AR5 that there is no increased risk of more intense or frequent droughts in their region from AGW. This research work does not need to be duplicated. What they do NOT know is whether or not natural forcing or variability factors could result in an increased risk. Ergo, that is what they want some research advice on. Quite logical – and has nothing to do with “politicized funding” at all as far as I can see. > this “ain’t necessarily so”. Necessity might not been necessary here. Farmers would appreciate a practical guide to which way the screw is going to turn rather than admonitions from computer pedestals that ‘it’s only going to get worse and it’s your fault’, and so might their representatives. So if you know the anthro forcing, and we do, we do, then determine the natural variation. Simples, assuredly. Well, and by Judy’s little rainfall graph upstream, if the anthro forcing leads to less rainfall, then Nebraska would be wetter now, naturally, and if it leads to more rainfall, then Nebraska would be drier now, naturally. And, we can deduce from that graph that the Anthro effect is small. There, I threw that in for some baksheesh for the easy many grand. I posted some things on the SCC thread by mistake. Here is the gist. A gem from the link is from the original sponsor of the bill who did not want “cyclical” added. “The bill’s sponsor, Sen. Ken Haar of Malcolm, a Democrat and the leading environmental voice in the Legislature, wanted something broader. “ ’Let’s just embrace ignorance, and let our children deal with the consequences.’ That’s what that sounds like,” he said. Look, we want smart farmers; the state, any state, doesn’t need any help looking stupid. People at rival schools say the N stands for Nolledge. Just quoting. And Penn State should be the state pen? Climate scientists, “so called climate scientists” who believe religiously in peer – reviewed Climate Consensus are really not the people you want to pay to study anything with enough skepticism to see and recognize any data that disagrees. If you must go out of state to get qualified people with less Consensus Bias, then go out of state. Don’t Pay anyone to do what they already told you they will not do. If they are on the State Payroll, replace them quickly, they are a threat to the education system. If they want an objective study, the would ask for one of just climate change, not “cyclical climate change” whatever that is. That is just a political qualifier in the first place, asking for a study to be used for advocacy of a particular position that believes in “cyclical climate change”, and not surprisingly taken as a red flag by academic scientists. An academic would not mind a study that is allowed to prove or disprove the importance of “cyclical climate change”, but not one that starts with assuming it in the title. Studying cyclical climate variations without studying anthro influences? Absurd. Every climate “scientist” currently studying Milankovitch cycles should return their grants. Ditto those studying the AMO, PDO, glaciation or any other historical climate cycles. Send those refund checks now or forfeit forever your claim to be scientists, rather than mere political pawns. All scientists should return their “Pay Checks” if they are no longer Skeptic. Frankly, as I read the bill, it does not prevent inclusion of whatever variability there may be in the NB record; it can be interpreted as not wanting attribution. Frankly, even the $22K could pay for reprising the natural record – it’s the over-interpretation of data that costs so much! All grants have restrictions. These scientists do not like that particular restriction. I don’t see how the restriction is more onerous than, for example, restricting studies of vegetation changes to species that have grown continuously in Nebraska for thousands of years; or excluding ice cores from Greenland. I see this as a matter of interest, not principle. It’s the word “cyclical” apparently, which is a presumption built into the funding. No! They are already receiving funding that is biased toward supporting AGW. They turn down funding that will likley lead to results that cut off their AGW funding. It is not about what they believe, it is about where the big money is coming from. Looks like a good place to begin: all future climate research should be outsourced to China. Following this, how about confirming that Nebraskans are not in danger of rising sea levels due to AGW. that accounts for the time-varying statistical characteristics of the temperatures, as well as the dependence on solar radiation. The model is fit by maximizing an approximate likelihood, and the conditional simulations result in well-calibrated confidence intervals for the predicted temperatures. We also describe methods for handling spatial–temporal jumps in the data to interpolate a slow-moving cold front. It is limited to a month of data, minute-by-minute temperature data in a region of Oklahoma. A FIGURE THAT I CAN’T COPY/PASTE from the downloaded pdf. Maybe someone can show me how. FIG. 3. Comparison between solar radiation measured at the central facility and temperature differences measured at two sites, EF-13 and EF-24. Site EF-13 is the site nearest the central facility, where the solar radiation is measured. Anyway, the variability of first differences in the temperature series is much greater in the day time than at night, and is positively correlated with sunshine: that is, increased sunshine increases the frequency of downward as well as upward minute-to-minute changes in temperature. It is only 1 month, and one region of Oklahoma, but it is suggestive of an interesting phenomenon to look for elsewhere. I wrote about this little incident on my own website (http://donaitkin.com/an-odd-story-about-research-into-climate-change/), and I’m still puzzled. Any half-way interested researcher ought to be able to apply for the $44k in a way that preserves his or her sense of dignity, but deliver what the legislators want. Why the fuss? Hi Don I agree. I am tweeting with Gavin about this, the main objection seems to be their refusal to consider AGW. Well AGW seems to be getting a lot of consideration, whereas natural internal variability seems to be the main driver on the time scales of interest, and is getting insufficient consideration. So political posturing on both sides; you expect this from politicians but not from scientists. Why not consider both with the grant and leave the politics out of it? Why not consider both [natural and anthropogenic factors] with the grant and leave the politics out of it? IPCC has already reported on the anthropogenic part, concluding (AR5) that no increased risk of more intense or frequent droughts in the region of Nebraska as a result of AGW could be identified. In addition, the historical record shows cyclical variations but no underlying trend that would suggest an AGW component. So they are quite logical in restricting their study to natural factors (especially since they are only willing to spend $44,000!). This is about science getting back to real skeptic science. Consensus Science has never been real science. Paul Vaughan, Thank you for the Sidorekov link I saw posted elsewhere ! It’s dense stuff, or I’m dense. Help. It needs to go on the back of a card. Is that gonna be black hole dense? Would Judy consider posting the Sidorenkov work as a thread so that in the crosscurrents of informed and uninformed commentary I might be able to detect a tide in the affairs of Nature? Yeah, I know, selfish. kim, I’m going to suggest that given the length of this valuable resource we all need time to carefully digest. I suspect that if Judy ran a thread on this today, 99.9% of the commentary would be based on 99.9% ignorance of Sidorenkov’s book. Given adequate time & resources I can compress productive attention targets, but it isn’t feasible to do a good job in a hurry. I’ll be in a better position to suggest a course towards distillation several weeks from now. Meanwhile I’ll probably continue dropping casual notes here & there. Btw, reading one of the chapters last night I learned something crucial that empowered me to crack a shelved QBO / polar motion problem within a few minutes. The match is exact all the way out to several decimal places. This book is a valuable resource = big understatement. You’re an awful tease. I’m gonna have to go look for myself, and what makes you think that’ll do any good? When I find time I’ll short-list key sections & figures. For now section 8.7 is a guaranteed-good place to productively get started. A grant funds the study and analysis, not the conclusion. Drug companies farm out trials all the time, especially at early stages, so they don’t waste money on an nonviable drug. My anti-glioma drug seems to be working, in a mouse xenograft model of human glioma. If the drug company goes into the next stage, the toxicity trials will be done in dogs and be quite independent. Calls for work on “cyclical climate change” are met with a response that would be akin to one that might ask for the effects of the coming global cooling on agriculture. They are propositions that are not supported by the real world. If you want to study a parallel universe that has “cyclical climate change”, that’s fine, but most would consider that a waste of time. Jim D, right, because it couldn’t possibly ever get cooler in the future. That’s not to say they can’t study the effects of cooling on agriculture. Cooling has happened in the past so it can be studied. Funding for that might look silly when aimed, as this one is, at helping today’s state government with decisionmaking, but that shouldn’t stop them from funding purely academic topics like this. Better yet would be to have one team study cooling, and another warming, then they can hedge their bets rather than betting on one outcome. Jim D, I’m beginning to think you are Superbrain from the Planet Krypton. No regular human being could be so smart. Andrew, if you were a Nebraska taxpayer, would paying for a study into cooling or warming be a better use of your money? That is what it comes down to. Seeing that this is Nebraska, they want to study their deeply hoped-for “cyclical climate change”. Perhaps that means warming before hoped-for cooling, who knows how they think? In the case of Nebraska, I am not sure I would want to give them any money for science studies either if this is what they do with it. Luckily it is not much, but it is a waste. JimD, Is it just that an agricultural state legislature appears to be more concerned with drought than temperature that bugs you or the fact that drought and the pseudo-cyclic PDO have such a tight correlation? It was significantly colder when Nebraska became an agricultural juggernaut. I don’t think they’ve forgotten how to use a thermostat. captd, there are studies connecting various indices (PDO, ENSO, etc.) to regional droughts, and I am sure those are also good things to study further. These indices are not well described by the term cyclical climate change, because they are not climate change at all, just natural variability that cancels over the long term. Confusion between natural variability and irreversible climate change is a common problem among skeptics, and the terminology is an issue here. Yes, there does seem to be a great deal of confusion between natural variability and climate change since part of a “climate” would be the natural variability :) Climate Science has thus far indicated that “irreversible” climate change is somewhere between not so much and we are all going to die and hasn’t done a very good job of closing that gap. Climate science has also focused on the “Carbon Monster” so hard that finding more remote locations and methods to eliminate the “pause” appears to be a major priority. No so remarkably, the estimates of Guy Callandar and the second attempt by Arrhenius still seem to be the “gold” standard. captd, well, true, we may only see the irreversible part in a convincing enough form for the deepest skeptics when we have passed 700 ppm on the way to 1000 ppm. It is early days yet because 1 degree so far is not perceptible enough and the sea level is still rising slowly. Greenland even still has a glacier and some skepticism will only melt with that rate. Then we do have MODTRAN don’t we :) Try a tropical climate with clouds looking up from the actual surface. 400ppm to 1600ppm about a 1Wm-2. It is almost like that planetary boundary layer with the super-saturated water vapor and convective entrainment zone has a negative feedback. I believe I have mentioned in the past how it seems that the sign of cloud feedback appears to be wrong and that CO2 increases upper level convection. The cloud base 2.4km with 3km top looks to be a fair estimate of marine atmospheric boundary layer clouds. Lost of clouds over the ocean though the ITCZ does tend to shift periodically causing changes in the southern hemisphere westerlies. Have I ever mentioned Toggweiler? captd, yes, skeptics only believe the climate change they see out of their window, and the cloud negative feedback isn’t panning out for them, so they probably now would like the clouds to change spontaneously in the right direction. I love how you switch to minion speak when cornered. The first three “real” rules of thermodynamics is KISS, ASSUME and FOR, when you pick a fictitious Frame of Reference (FOR), things can go south in a hurry. CO2 doesn’t leap thermodynamic boundary layers in a single bound. Turbulence rules in fluid dynamics. In Australia, the continent of swings and extremes, we have often had “medium confidence that there has been an overall slight tendency” toward wetter or dryer. Nobody in the droughty 1940s dreamed that an inland sea the size of England and Wales would form to the west of Sydney in 1955. Nobody in the late sixties drought-and-fire period could see the soaking 70s coming. But they came! I once ran into a hydrologist while hiking the Myall Lakes in the 1980 drought. He told me that all his work in the region had consisted of flood mitigation plans. Everyone, even the professionals, counted on the 70s “trend” continuing. Yet 70s rain went the way of 70s bell-bottoms. Two weeks ago I was going through one of those “hottest ever” springs, and I had given up hope on new bamboo for the year. The BoM, after months of predicting wetter than average had finally changed its 3 month outlook to drier than average. Now it’s nearly summer. I’m cold and wet and there are new poles thrusting skyward. The IPCC charta clearly restricts investigation to human causes. I am baffled that in spite of this grave assault on scientific freedom Mark Svoboda of NDM, Nebraska was among the Reviewers of the IPCC WGII Fourth Assessment Report. Anyway, I can understand why he didn’t feel entirely comfortable speaking on the record about it. Wouldn’t understanding the scientific basis of human-induced climate change necessitate examining anthropogenic causes in context with natural variability? Would you think studying anthropogenic causes of climate change without placing them in context with natural variability to be a valid endeavor? It sure would Joshua. The problem is sorting out the anthropogenic chaff from the natural chaff given that chaff is chaff whatever the cause. While it’s a storm in a teacup ($44k is chicken feed in the world of research grants) the huffy and precious reaction from these academics is very revealing. All that is being asked for is a bit of data collection about long term precipitation statistics in Nebraska. Even if the researcher accepts the AGW theory, where is the harm in looking at the numbers going back before 1950, or whatever the date du jour where human activity becomes significant is? The entitlement mentality on display here – “give me money for what I want to do, not what you want to know” – tells us that these people have become very arrogant. They seem to have forgotten that their grants are funded by the taxes of other citizens, most of whom don’t have any say in what they are being paid to do at work. Yes, Johanna, especially since that “cyclical” climate change with its natural causes may be all the climate change any of us are going to get. Just as well Goyder looked into those natural and cyclical things in the 19th century. Too bad for all those South Australian settlers who ignored him and were convinced that rain would follow their faith-based ploughs. Since the very best climate science is also hopelessly inadequate climate science, Nebraskans may as well collect a few old precipitation statistics. $44k is cheap. Or is there a fear someone will dig up an old drought that’s “worse than we thought” (to borrow a phrase from state-of-the-art climate science)? You certainly got that one about the Goyder line right mosomoso. To try and get at least an idea on what lies ahead for the in this case Nebraska climate, it seems the logical thing to do is go back and look at the available observations, look at any and all available historical records even if they are anecdotal, look at all the climate proxy data that is available and that should take a researcher back some hundreds of years at least . The most accurately recorded period will be from when the region was settled and started to be farmed a hundred or so years ago on an intensive scale and that period then already has the human influence incorporated into the data. The graph above covers this period and the cyclic patterns can be seen in the long term summer rainfall. Using that type of data will give a fair indication of what sort of summer rainfall trends, not ever for the individual summers but for the collective whole of summers during a period of some decades, a rainfall trend and the timing of the switch in those collective rainfall trends or temperature or humidity and etc that will extend for a long way into the future, a particularly important long term prediction item for farmers as I can testify. It certainly would have made a hell of a difference to a lot of my past farming decisions if I had known about the effects of the PDO cycle in our Australian region as I could never quite figure whether or why those long term shifts in weather, rainfall, temperatures and etc were due to my imagination or were for real during my farming career over some nearly 6 decades . Now the psuedo climate scientists in Nebraska won’t study anything unless it has an anthropogenic component in it. What they are effectively saying is that they are catergorically able to foresee and predict the changes that will and are constantly occurring across the entire spectrum of humanity and his activities and transfer and accurately calibrate those predicted changes to effects on the climate. Nobody has a clue as to what and how technologies, population shifts energy sources of every type and possibly even fusion within a couple of decades or all those other factors that make up our civilisation will change and shift even over the next decade. Nobody has clue about how those shifts and changes are going to or maybe not going to or never will affect the climate of the future because they don’t know what the future holds or what types of technologies will suddenly emerge which changes every equation in energy use. Nor will they ever know until it happens if it ever does. Nobody foresaw the incredible impact on the internet. Nobody foresaw China’s rise to a major industrial nation at then or the speed at which it as has happened along with China’s so called emissions of CO2. In a financial sense it would have been a bit like asking a financial analyst back in 2000 to do a study of the historical stock market system as it had operated for a couple of centuries. We all now know just what a financial calamity that was for all those who did go down that path. But that is exactly the same attitude and same type of situation that the so called climate scientists are placing themselves in when they refuse to study the natural shifts in the Nebraska climate unless it has it’s anthrogenic Enron equivalent included in the study. No wonder there will be tears, many, many tears amongst climate science when history in the not very distant future start to rake over the dying embers of what once had a very good chance of becoming a respected science. The reasons yields are up are manmade seeds, manmade fertilizers, manmade CO2, manmade pesticides, manmade etc., and you don’t want studies that include manmade? Your study would have concluded Erlich was going to be right. The reasons yields are up are manmade seeds, manmade fertilizers, manmade CO2, manmade pesticides, manmade etc. Around 15% increase has been (conservatively?) attributed to higher CO2 levels since the 1970s. There may have been an additional small part from slightly warmer temperatures and longer growing seasons, a secondary effect attributable to these higher CO2 levels. Stuff for which to be thankful. Now it is my speculation that the University of Nebraska climate scientists don’t want to know about natural variability. Too much input! Stick to what you know: They did it. The Earth’s climate has changed throughout history and will continue to change in the future. Global climate change can be attributed to natural and anthropogenic (human) causes and can occur on both short-term and long-term time frames. A volcanic eruption is an example of natural short-term climate change. When ash is ejected into the atmosphere, it temporarily blocks a portion of the incoming sunlight and subsequently cools the earth. Powerful volcanic eruptions that reach the stratosphere, such as Mt. Pinatubo in 1991, can decrease the global average temperature by nearly 1° for one to two years. Other powerful eruptions have occurred in recent history and have changed the global climate. The Krakatoa eruption of 1883 led to cool conditions and global weather pattern disruption for several years, and the Tambora eruption of 1815 led to what is known as the year without a summer in the northern hemisphere. El Niño and La Niña oscillations are good examples of natural short-term causes of variability in the climate system. When the sea surface temperatures in the equatorial Pacific are warmer (El Niño) or colder (La Niña) than normal, global wind patterns change, which in turn affects temperature and precipitation patterns around the globe. Nebraska typically does not experience as strong an influence from these events as compared with other areas of the U.S., such as the west coast and the southeast. These patterns run in cycles that can last a few years. Climate also changes on a much longer time scale, i.e., cold glacial periods and warm interglacial periods in the geologic past. Long-term climate change, on the order of thousands of years, is caused by variability in Earth’s orbit and resulting changes in the amount of solar radiation we receive. From analyzing concentrations of carbon dioxide (CO2) in the air bubbles trapped in Greenland and Antarctic ice, and other types of proxy records such as tree rings and deep sediments, we know that Earth’s temperature has varied by several degrees in the past, causing long periods of warm and cold global climates. Currently, we are in an interglacial period after coming out of the last ice age about 10,000 years ago. – – Climate Change: What Does It Mean for Nebraska? Weather trends are studied to determine what climate changes are occurring across the U.S. This publication describes trends found in Nebraska. Add in a couple of sentences about cyclical variability and uncertainties regarding natural factors, tell them that it is “more likely than not” that there will be no substantially increased risk of more frequent or intense droughts in most of the state of Nebraska over the next three decades, based on “expert opinion rather than formal attribution studies”, attach a few colored graphs with squiggly lines, refer to the IPCC AR5 conclusion that there is no increased risk from anthropogenic forcing in this region either, attach your invoice for $44,000 and mail it to the good Nebraska lawmakers. And don’t forget to give me my 15% cut for consulting you. The rapid response of temperature to day and night and summer and winter and the recovery of temperature after Volcano Eruptions show that Earth is always in or near Equilibrium. There is no large out of balance condition. Earth temperature is well inside the same bounds we have been in for Ten Thousand Years. CO2 only does good things for us and not anything bad. Just on the subject of Nebraska Legislature compared to the IPCC. While the IPCC might be able to ‘do’ something, that is move some serious money around or cause to be moved, the Nebraska Legislature might be able to ‘know’ something. The Legislature might be more capable of looking after its citizens along the lines of local versus International effectiveness. As much as we like to deride politicians, they still are the link between us and our governments. They are the ones with the local money, and in a good position to ‘know’ what their people want. And perhaps even to know more about climate change and variability in Nebraska than the IPCC does. This story may seem small to the world, but it’s these types of disagreements where much will be settled and decided. If Nebraska is like Minnesota, the Legislature does pay attention to what its land grant Universities are doing. It does throw money at them. A ballpark number for Minnesota is half a billion a year. Few scientists would say the Dust Bowl was caused by humans, even though poor farming practices clearly exacerbated it. The policy initiatives, the glass seagull act,and the soil conservation act both produced stability for both the financial sector,and the agriculture sector. the agriculture sector is still relative stable,the financial sector is unstable in the Minsky sense. The plow that broke the plains. It was Soy that healed them though. I wonder how much it would cost to plant 5 different types of crops in adjacent fields and measured the changes in the daily temperatures in each field, during the course of a year? DocMartyn, there is actually a study of crop albedo impact on climate. Lighter colored sugar beets can drop local temperature by a degree or two. Captain, the amount of transpiration would have an effect. So does decreased tillage (seed drills etc) and irrigation . I detect a sense of outrage among CAGW believers here that Nebraska politicians have allegedly acted politically. The real issue is not a political one at all. IPCC has already collected the R+D work on anthropogenic forcing of droughts, and concluded (AR5) that for the Nebraska region there is no higher risk of more intense or frequent drought from this cause. Now the lawmakers want to know whether or not natural forcing cyclical variability could potentially increase such a future risk. But the outrage continues, nevertheless. Yep. CAGW is a highly politicized field. The outrage was directed against the scientists in the original post (apart from the sensible words by Nielsen-Gammon). The response was that it was misdirected. I’m not a “CAGW believer,” so I can only assume that comment was not referencing my comments – but still, I for one am not “outraged” that politicians would act politically. My point was that it is hypocritical for “skeptics” who are constantly complaining about politicians acting politically in response to the science of climate change, to suddenly pretend that politicians aren’t acting politically. I’ll also note that all of a sudden, Judith isn’t particularly concerned about the mixture of political advocacy and the science of climate change. Since the behavior of the ‘Climate Scientists’ at the University of Nebraska provides a textbook example of the generic behavior of Climate Scientists (with vanishingly few exceptions–thank you! ), as exemplified on this and other sites since I have been reading them over the last few years, I am astonished that YOU are astonished. But then the trusting frog, knowing the nature of scorpions, was nevertheless astonished when the scorpion did as scorpions do. The highest temperature recorded in Nebraska is 118°, Fahrenheit. This record high was recorded July 15, 1934 at Geneva; on July 17, 1936 at Hartington; and on July 24, 1936 at Minden. Must’ve been all those Ford Model A’s out there. Or maybe it was those newfangled Ford V8s that dunnit. Maybe it was in part because the soil surface was black because of poor farming practices and drought. The area where my father’s ranch was had the highest temperature in the state’s record, and the record temperature happened during the Great Depression: 120F. This photograph was taken in 1935, just a few miles from Dad’s ranch. It typifies surface conditions in the Eastern Dakotas during the Great Depression (vast expanses of black soil). Naw, JCH. Forget about the rationalizations. Maybe it was in part because CO2 is NOT the climate control knob and Hansen’s prediction of more warm extremes is wrong. But it was cooler instead! So much for the “CO2 climate control knob or Hansen’s prediction of more warm extremes (both wrong). manacker, are you choosing a US local peak year in 1934 and comparing it with a US local minimum year, and reading a meaning into it that there is no global warming? It looks like that is what you are doing, which is very disappointing. Although you did preface it with “forget about rationalization”, so maybe you were just demonstrating that thought. are you choosing a US local peak year in 1934 and comparing it with a US local minimum year, and reading a meaning into it that there is no global warming? That’s not what I am doing. The post here is about Nebraska climate (not global warming). And I am not comparing a “peak year” with a “minimum year” – simply pointing out that peak Nebraska temperature of today is not as high as it was in the 1930s. Since the average temperature should have gone up by over 1C as a result of AGW (from well-mixed CO2) and (according to Hansen) higher averages = higher peaks, I simply pointed out that these premises were not corroborated in Nebraska. Got it now? Really quite simple. But for man, the globe would be colder; just how much colder even kim doesn’t know. Postulated feedbacks increase this by a factor of three, so 6.6 W/m^2 net energy retained that would otherwise have escaped to space. So, if we had not had the vision and foresight to do all the good anthropogenic greenhouse things we did, our planet would be 1.8C colder on average than it is today = a globally and annually averaged 13.2C versus 15C (or close to the depths of the LIA). Gad! I hope those merrymen are wrong, wrong, wrong! Otherwise, to the iceboats, wimmins and chirruns first. Note: despite the impression given by the post, the Nebraska study is to cover all aspects of “cyclical” climate change and its impacts, not just droughts. The distinction is not particularly relevant to the issues CFACT and I wrote about. Regarding droughts, though, I’m puzzled why many seem to think the likely sign of the potential impact of anthropogenic climate change on drought (positive, negative, zero, or unknown) should make a difference in whether to mention it at all. Drought and record temperatures tend to correlate pretty well. In Nebraska and most or the plains states, PDO and drought correlate pretty well. Still looking for that anthropogenic fingerprint on the PDO. Al Dutcher comes across as a straight shooter. This must have been yet another mind-blowing event. Anthropogenic causes of climate change are so small compared to natural variability that we should consider them less than nothing. They’ve discovered where Mann found his mad paleo statistical skills. “A gigantic ‘communal latrine’ created at the dawn of the dinosaurs has been unearthed in Argentina. > The U.S. Chamber spent $35m in the 2012 election, 94% on behalf of Republicans, and were one of the top (if not the top) financial supporter of the Romney campaign. “The usual measure of unions’ clout encompasses chiefly what they spend supporting federal candidates through their political-action committees, which are funded with voluntary contributions, and lobbying Washington, which is a cost borne by the unions’ own coffers. These kinds of spending, which unions report to the Federal Election Commission and to Congress, totaled $1.1 billion from 2005 through 2011, according to the nonpartisan Center for Responsive Politics. Oil and gas companies are always among the industries to spend the most on lobbying, pouring $132.2 million into these efforts in 2008 alone. Perhaps the grant is indeed political. It comes from the legislature after all. All such grants are to some extent political. But I really don’t see what difference that would make. The question in deciding whether to accept a grant is not whether or not it is political but rather whether the terms of the grant allow you to do good science. This one does. The extent of natural variation of drought is surely an interesting and important scientific question. Working on this question doesn’t seem to violate any scientific ethic that I am aware of. The grant doesn’t ask for any particular conclusion to be made about the extent of natural variation. The only thing I can conclude is that Nebraska climate scientists have no interest in studying natural variation. Do we need to repeatedly spend our hard-earned money on wheel reinvention? Supposing CO2’s role in climate is rock solid known (i.e. ridiculously simple monotone rise, as has been hammered relentlessly by authority), why spend another dime on it?? Why not devote ALL climate research money to exploring natural climate? Why is more $$$$ research needed to understand a ridiculously simple monotonic rise???? It doesn’t make any sense unless this is a giant political campaign, in which case it makes TOTAL sense why more money keeps getting poured on this already “solved” problem. Cost = We keep paying for it over & over & over & over & over again…. Why do we need to buy this simple slanted line an infinite number of times??? It makes no sense unless the wheel-reinvention spin-cycle is purely political. It would make eminent sense from a pragmatic point of view to divert all of the political wheel-reinvention spin-cycle money towards more productive (non-redundant) uses. I suggest it be spent on productively exploring nature. But less overhead through my private company. > Planning isn’t the job of the research scientists. Planning isn’t the job of the research scientists. Their job is done and their services are no longer required if all they have to contribute is a slanted line. Exactly. This is the politicians talking. It’s a squiggly slanted line (if you want to get it published). But in this case the actually observed line wasn’t slanted – only squiggly. So the pols wanted to know whether or not the squiggles would continue. We pay their wages so we’re their bosses. From a business point-of-view it makes no sense to keep paying for the same thing (a simple slanted line) an infinite number of times. We’re not running a cradle-to-grave charity. Let’s get these climate scientists doing something productive. We can give them a choice: Either figure out how natural climate works or be laid off. We’re not running a charity that pays you to rediscover a slanted line 10000 times. There will be many climate scientists who won’t be smart enough to figure out natural climate. They have no utility. We’re not running a charity. UK’s elderly may face the need to engage in consensual huddling to stay warm if record winter cold again visits this once great power that has become an impotent island in a sea of Eurocommunism. Why insisting in the confusion between climate variability and metheorological variability? A year ago oil in storage stood at 274 million barrels, and with another robust year of domestic production, and despite curtailed imports, the US Oil Inventory stands at 391 million barrels and climbing. We are still technically in the building season for oil supplies which peaked in late May just shy of 400 million barrels, before the drawing season kicked off with the exporting of gasoline through increased refinery utilization led by the gulf coast refiners with their increased capacity to take advantage of the spread differential and cheaper operational energy in natural gas to export refined products more competitively than peer nations. The domestic need for refined products was stagnant at best, the real demand was in the export market, without a robust export market for refined products, oil supplies would have crushed the 400 million barrier this summer, and prices at the pump would have been much cheaper here stateside. So the drawing season accounted for roughly a 40 million barrel retracement in US supplies, and we are not even close to the middle of the building season, which even by conservative estimates should continue until mid-March of 2014. Shimizu Corp, which is based in Tokyo, wants to lay a belt of solar panels 250 miles wide around the equator of the Moon and relay the resulting constant supply of energy to “receiving stations” on Earth by laser or microwave transmission. The proposed ‘Luna Ring’ would be capable of sending 13,000 terawatts of power to Earth. In 2011, the US generated just 4,100 terawatts of power, the company says. They tried to create this in a university setting, but there was too much overhead. We can’t do that — the magnetic flux of he Earth would be so disturbed, birds might fly north in the winter, apple trees could bloom in January and polar bears may fall from the sky. Moon cheese, deep-sea methane clathrates – you name it, the Japanese are hungry for energy. And they are very clevah. This is known, but unproven technology. It’s among my solutions if we are entering glaciation. Sounds like a good weapon. It was the proper thing for any reputable scientist, warmist or skeptic, to turn down this money, when the original sponsor of the bill calls it “wasted money” after it was bastardized for political purposes. And should every tobacco/cancer researcher also have turned down funds to study the link between the two? Only if the money came from Heartland. They were paying top dollar to any researcher who could provide any research which raised uncertainty about the link between smoking and cancer. So OK to accept funding to prove a link, but not to accept funding to disprove a link? Are you unable to see the hypocrisy in that statement? Thank you Professor Curry for this blog. Professor Kuroda’s autobiography of his life at the Imperial University of Tokyo and Aston’s 1922 Nobel Lecture helped me to finally realize the root problem: FEAR of reality. It is quite simple: 44K is a joke in today’s climate game. Turning it down was also easy because it reaffirmed their dedication to the CAUSE. Kaufman et al. who discovered that Arctic warming started with the twentieth century had more than four million to spread around. This paid not only for principal investigators but also for student volunteers who did the dirty work. That must be close to the going price for climate investigations. Despite having gotten good results thanks to student volunteers who did the digging in the mud Kaufman et al remained loyal believers in AGW. As a result, they missed the opportunity to report on the true state of the Arctic that you will find in my paper that utilizes their results. A new settler to the Nebraska plains and his wife have built their cabin and stocked up with plenty of firewood for the winter ahead. Her husband doesn’t know the answer, so he goes out and chops more firewood, stacking it all around the cabin. But the wife is still worried and asks her husband again if he’s sure there’s enough firewood. So the settler asks a neighbor who tells him that there is an Indian chief, up on the hill, who might know about the coming winter weather. So the settler climbs up the mountain and finds the Indian chief. The Indian chief looks over the edge of the cliff across the plains, sniffs the air, and says, “Winter”. The settler goes back down and chops more firewood, but his wife is still nervous, so she sends him back up the mountain. The settler chops even more firewood, but his wife is still worried and sends him up the mountain a third time. I’ve heard this one before and had one question about it: Where did the settler find all that wood to chop on the Nebraska plains? For those making the argument that to investigate the link between natural variability and drought, without also studying man made links, lacks scientific integrity please share your thoughts on the integrity of all the funding and research into the link between tobacco and cancer? Should have/did all of that research also consider natural causes of cancer? “Can we have a scientific prediction of the likelihood of droughts in the State over the next 10, 20 and 40 years (from whatever cause) given the data available to date”. No pre-conceptions and should sort out the ratios of the various factors that might bear. Perhaps a model based on Fig 1 with a forward projection of the observed cycles to date might prove just as accurate as one based on other, more complicated, factors. would be interesting to see which was more correct. A simple thought: Neither models nor men have any idea what the effect of AnthroCO2 will be in specific regions. So why study it regionally? Much better to work with the natural processes, which have regional specificity. There, now, academics, can you see your way clear? The wording of the request was clumsy, but I think they want an analysis of observed weather patterns, without any bias from GCMs. Sure, a GCM can give no clue to a farmer, and farming is what this request was about. Truly, it wasn’t for the benefit of the academic researchers, though they seem to have thought so. As a PhD, I am really saddened and mystified by your attitude here. this has nothing to do with climate change or lack of cc; it has to d with fundamental issues of how our democracy works. If the legislature is saying to researchers, you can only do this, what is next – we fire any tenured faculty who publish a paper with the words “climate change ” ? or, here in MA, we fire anyone who denies cc ? I’m really sad that you can’t see this; I may not like what you say, but I will defend your right to say it. Because this is the USA, the greatest country in the world. IPCC was founded to build the case for AGW. Are you not saddened by that? If you believe in the cause, you are happy. If you don’t believe it, you are saddened. Why would science have anything to do with your feelings and beliefs? If the legislature wants to pay the researchers to do research that they think is important and the researchers choose to do other research, that the legislature thinks is less important or not important, of something that has been researched too much with no progress, then the researchers should be fired or left to find their own grants to support their Alarmism. Nebraska is corn, pigs, and cows. 70% of their corn crop is irrigated. It’s very rare for dryland corn, the 30%, to be wiped out by drought. When it is, the irrigated corn is worth way more. They do this because they are completely opposed to allowing anything to be natural, or to do anything in a natural way. I’m announcing I’m running for this clown’s seat in the legislature. I say spend the 44k on finding a decent coach for the Nebraska football team. I suggest you make a formal offer to Nebraska lawmakers that you are willing to accept the grant. If not you, refer them to others who will accept it (Lindzen, Spencer, Christy, Singer, etc.) Don’t waste this opportunity to do science just because of politics. There are two types of people in the world: those who’d accept the following proposition and those who wouldn’t. A pond of interest has some ordinary water in it. For $44,000, determine how much water. Easy enough, right? However there is considerable disagreement as to whether this pond is contaminated with heavy water, D2O, as opposed to ordinary water, H2O. Some say perhaps half of it is heavy water. Others deny that any heavy water could have gotten into the pond. A complication with the funding for this assessment is that the documentation for the assessment is not permitted to mention heavy water. Those who believe there is no significant heavy water in the pond will see no problem with this $44K proposition. Those who believe that some assessment is needed of the heavy water in the pond before a reliable statement can be made about the ordinary water are likely to balk at the restriction that they are not permitted to say anything about heavy water. The former type would accept this $44K proposition in a heartbeat. The latter type might do so too, though they would be more likely to feel that they were compromising their principles in agreeing not to assess how much heavy water was in the pond. Seems to me this scenario is not terribly different from the Nebraska drought proposition. If the request was simply for the total water, it’s hard to see the ethical quandary. Finding the total volume of a pond is elementary. Why should one feel compelled to further delineate between types of water when it’s not germane to the task? Even more so with “Natural” vs anthropogenic warming, where complete and accurate separation of the two is beyond any honest capability? This bias cuts both ways. You see one way.because you want to see it. A real scientist would present the truth as he found it, regardless of the framing of the question. @Santoron If the request was simply for the total water, it’s hard to see the ethical quandary. But easy to see your exposure to a liability suit. Even if the jury bought one of your arguments you’d have burned through far more than your $44k and it would be a Pyrrhic victory, not to mention the heartburn. On the plus side you’d be famous. Might be better however to take the $44k and emigrate before anything hit the fan. That way you’d be famous and scot-free. In spite of appearances – our knowledge about the effects of (not only) drought eg the Sun, is negligible. On the NOAA, is still the sentence: “However, our understanding of the indirect effects of changes in solar output and feedbacks in the climate system is minimal.” (global warming – natural variability, http://www.ncdc.noaa.gov/cmb-faq/globalwarming.php). But we all know how including for manmade warming goes. First they look at climate records and notice that it is cyclical and nothing unnatural is happening. Next they abandon that conclusion, tag on a global climate model projection that is inadequate, inappropriate and a ramp change from the actual records and then declare without any justification or connection to reality that drought will become more severe unless we restrict greenhouse gases. This process is required in order to a) not have your report buried, and b) to obtain the next grant. I could literally write all such reports despite not having researched any droughts at all. There exist several reports by major climateers that find around 20 models that all say we should experience drought and so they concluded the result was ‘robust’. Yet the actual data said it was really getting wetter than ever in that region. Research is the finding out what nature does but if the real data says that droughts are not cyclical then that would indeed be very interesting because it would be a world first. A planned study on climate change previously approved by the Legislature was canceled by Gov. Dave Heineman on Tuesday. He says the study would duplicate work researchers at the University of Nebraska-Lincoln have planned. Heineman sent a letter to members of the Legislature Tuesday, noting that eliminating the study will remove $44,000 from the budget that was appropriated for the study. Researchers at the university’s Institute of Agriculture and Natural Resources say their study, which involves reviewing others’ work, will focus on identifying any human causes to climate change. They’ve set aside $20,000 for the study. That is in contrast to the state study, which was modified to require that only natural causes to climate change be examined. Some university scientists had expressed concern about the scope of the Legislature-approved study. The university study is expected to be finished by next September.